Diono is recalling select Radian R100 Radian R120, Radian RXT, Olympia, Pacifica, and Rainier convertible and booster car sears. The car seat may not properly protect the child if the seat is installed with only the lap belt. Nissan is recalling select 2016-2018 Nissan Titan and 2016 and 2018 Nissan Titan XD vehicles. The load carrying capacity modification was not installed, meaning an overloaded vehicle can violate safety regulations. Jeep is recalling select 2018 Jeep Wrangler vehicles. The rear underbody rail may corrode, causing the rear seat to become loose. 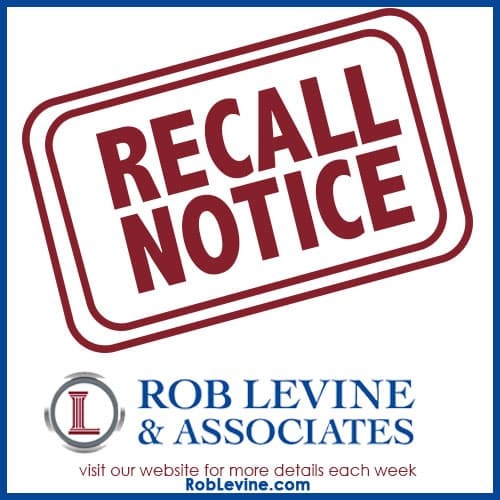 Audi is recalling select 2013-2017 Audi A5 Cabriolet, A5 Sedan, and Audi Q5 Vehicles, as well as select Audie A6 vehicles and 2013-2016 Audi A4 Sedan and A4 Allroad vehicles. An eclectic cool and pump in the engines can become blocked with debris causing the vehicle to overheat. Buick is recalling select 2018 Buick Regal vehicles. The rear seatbelts may have been improperly routed which would fail to adequately restrain passengers in a crash.